With Chromecast built-in, just tap the Cast button from your favorite mobile music apps to instantly start playing on the speakers. Then control the speakers right from your phone -- search, play, pause, and turn up the volume -- anywhere in the house. Choose from millions of songs from popular music services like Spotify, Pandora, Google Play™ Music, TuneIn and iHeartRadio or catch up on current events with NPR podcasts. New apps are constantly being added so there’s no end to the music, online radio stations, and podcasts you can enjoy. Discover more at https://www.google.com/cast/apps/. Play Spotify through your speakers, laptop and TV, using the Spotify app as a remote. Use the "One Touch" Play feature on the Playlist speaker to play your favorite playlist instantly. Chromecast streams directly from the cloud, so you get the highest sound quality. Enjoy crystal clear sound exactly the way the artists intended. 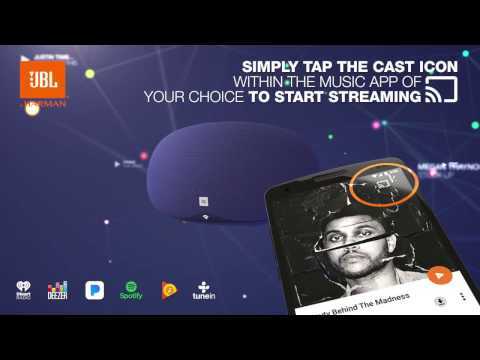 With Chromecast built-in, you can keep using your phone while you cast your music. Answer a phone call, play a game, send a text, and even leave the room, all without interrupting what’s playing on the speakers or draining your battery. JBL Playlist speakers have Chromecast built-in, so you can instantly cast music from your favorite music app, radio, or podcast to your speaker using your smart device. You can control the speakers from anywhere in the house on your iOS or Android device(s) in the house on your device(s) -- iPhone®, iPad®, Android™ phone or tablet, Mac® or Windows® laptop, or Chromebook. JBL Playlist is rated 3.8 out of 5 by 55. Rated 5 out of 5 by Jerry 67 from Great Sunday, easy set up. I bought 4 for our dental office, they sound great and the set up was easy . Rated 5 out of 5 by Dr Jerry from Sounds really good , nice styling. Chromecast is terrific. Rated 5 out of 5 by CodyK from Impressed for a small speaker The quality of the sound is great for small wireless speaker. I think it is perfect for a bedroom or other area where you aren't expecting a huge thumping sound. It is plenty loud and the quality improves after it is used for a while. The chromecast works awesome! As stated in many professional views, this is a great value speaker! Rated 5 out of 5 by Mykesgarage from Crystal clear sound This speaker has an exceptional sound. The highs, mids and lows are really clear, plus it's packed with loads of features for it's price. It gets pretty loud for its size and power, can easily fill a normal sized room. Can i control it with google assistant? For example can i say : hey google play spotify on my Playlist device? Actually, YES you CAN control it with Google Assistant! You can use the Google Assistant on your phone, tablet, iPad, Google Home, Google Home Mini, etc and tell it to play music on your Playlist. You can also use Spotify's Connect feature to play music directly to the speaker. And you can use the speaker as a Bluetooth device. I own 2 of these JBL Playlist devices, and I control them separately with my Google Assistant, as well as in combination with other devices around my home using Google Home Device Groups. When I start play music via Spotify Connect music starts but after several seconds there is only silence for several seconds and after that music plays again. When I use Google Cast (from Spotify or any other app) there are no issues. What the problem? I believe for Spotify 'Connect' to work you must have a paid subscription to Spotify. It will not work properly for a free account. Do you still need to buy a google chromcast audio with this? Hello, is there a pilot to connect my laptop to the speaker? The PC sees the speaker, but it doesn't play any sound... and if I &quot;cast&quot; via wifi there is a sound latency so it's not ideal. Yes you can. You also have the option of using the 3.5 mm jack to get connected to the playlist and enjoy music. Unfortunately we can't answer this. This is a question for your TV manufacturer or whatever source they are using to cast to your TV. If you are using a source, and the source is able to cast to 2 units at once, the TV for video and the speaker for audio, then it will work. It's up to the source component. Unfortunately the JBL Playlist cannot be connected to your TV to make it a Smart TV. The Chromecast built-in feature on it allows you to cast media from one device such as your smartphone into the speaker so that it allows the speaker to reproduce the same signal that was cast onto it. Using the Home app from Google, you can link as many speakers together as you want using Google Cast by creating a group.